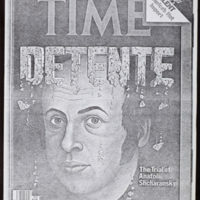 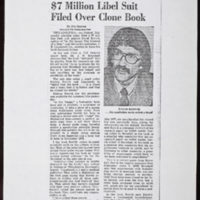 Time magazine clipping: "Costly Hoax?" 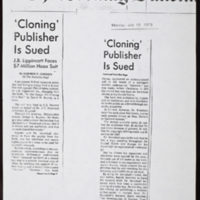 Tags: Cloning, Organism~ Publishing~ Rorvik, David M.~ Time, Inc. 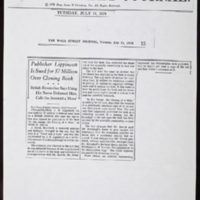 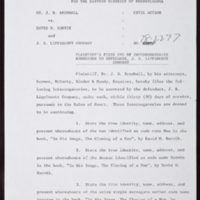 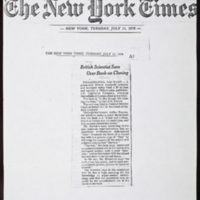 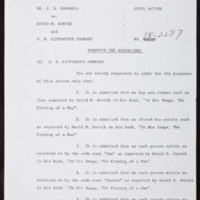 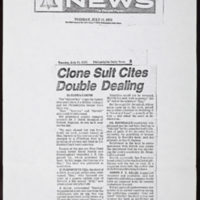 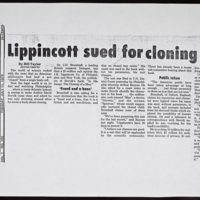 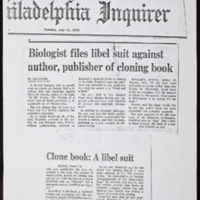 Tags: Cloning, Organism~ Publishing~ Quinn, Jim~ Rorvik, David M.
Wall Street Journal clipping: "Publisher Lippincott Is Sued for $7 Million Over Cloning Book"
The New York Times clipping: "British Scientist Sues Over Book on Cloning"
Tags: Cloning, Organism~ New York Times Company~ Publishing~ Rorvik, David M.
Tags: Campisi, Gloria~ Cloning, Organism~ Publishing~ Rorvik, David M.
Tags: Cloning, Organism~ Gordon, Harmony Y.~ Publishing~ Rorvik, David M.
Tags: Bromhall, Derek~ Cloning, Organism~ Rorvik, David M.